The easy downtown location friendly staff and cozy beds at The Westin San Diego Gaslamp Quarter are what get our guests talking. The 16-story non-smoking hotel offers 450 rooms with Westin's signature beds and deluxe showers and baths. There are 37-inch flat-panel TVs coffeemakers desks ironing equipment and hairdryers and the bathrooms are stocked with luxury toiletries. In-room spa services mean total relaxation and the fitness room and outdoor pool help you keep fit. There's also a business center and a cafe and a restaurant are among the on-site dining options. The hotel charges a facility fee that covers premium high-speed internet access free local and domestic long-distance calls and a food voucher. Parking is available for an extra charge and pets are welcome; they even get their own amenities bed and food and water bowls. 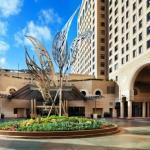 The Westin is in the historic and vibrant Gaslamp Quarterâ? ?a great place for dining and entertainment. A top-notch outdoor mall Westfield Horton Plaza is just across the street for hours of shopping and open-air enjoyment. If you're still ready for more head to Seaport Village for waterfront dining and retail therapy. San Diego Convention Center is less than a mile and San Diego International Airport is less than three miles away. Parking downtown can be tough but the hotel is happy to arrange parking for an additional charge.